Branislav Jovin (August 8th 1935) is a Sebian architect and urban planner. 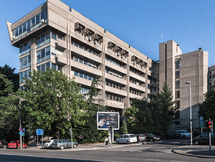 He became one of the key figures of the history of modern Serbian architecture after constructing the building of the Urban Planning Institute in 1970. He was for years Belgrade's chief urban planner.